Having an in-ground pool is a backyard dream. Pools provide instant fun for kids and a relaxing environment for adults. However, owning a pool is also a huge responsibility. If you’re a parent, you probably worry about the safety of your children around the pool. You can tell them over and over again to be careful and not to run, but for some reason they just can’t help themselves! Allow us to guide you through 10 pool rules your child should know before diving in. Cool kids follow pool rules! When kids play in the pool, the circumference becomes inevitably wet. The area surrounding your pool is a hard surface that can be extremely slippery and dangerous. When kids run, they are prone to slipping and falling. Kids will be more inclined to walk if they understand that they’ll miss out on all the fun if they get injured. Often times, backyard pools are not deep enough for children to dive into full speed, headfirst. Diving is prohibited in water depths less than 8 feet. Even if your pool is deeper than 8 feet, it’s best to encourage kids to jump in feet first for optimal water safety. Instead, introduce your kids to cannonballs and pencil jumps. Always have an adult nearby. Enforce this rule strictly, even if your kids are old enough to swim. Even if your child is a great swimmer, you never know what might happen. 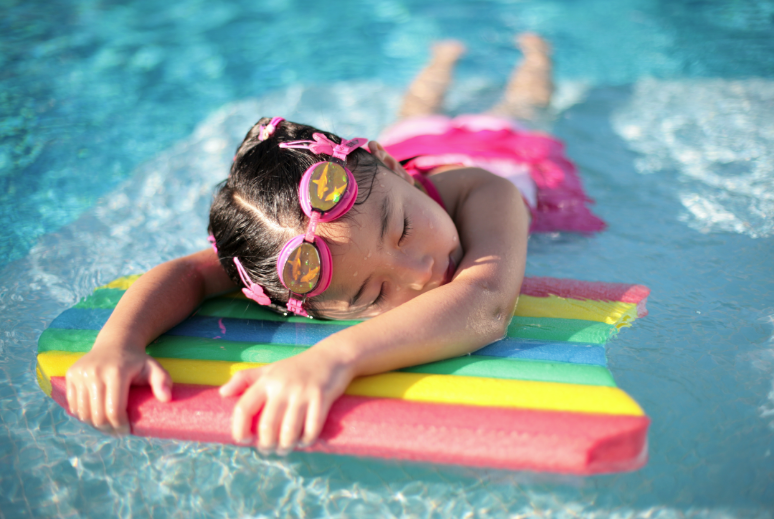 Swimming without parental supervision may seem enticing to kids of all ages. However, it’s important for them to know how dangerous that can be in the event of an accident. Encouraging children to swim with a buddy ensures a second form of supervision. Even great swimmers can get into trouble in the water, which is why it’s always important to swim with a friend. Plus, it’s more fun that way! Whether you’re lounging poolside or splashing in the water, always apply sunscreen (even if it’s cloudy). Without it, you and your kids are prone to painful sunburn and other potential health problems. Pool games are a fun way to get the party started. However, when kids get rowdy, they think it’s a good idea to start pushing each other in the pool. It’s all fun and games until someone gets hurt. Chewing gum may not seem like a complicated activity. However, the simultaneous activities of jumping, swimming, and chewing leave swimmers prone to accidental choking. This situation is easily avoided by advising your children not to chew gum and swim at the same time. Much like gum, food and drinks are choking hazards in the pool. In an effort to maximize safety (and sanitation), forbid your kids from bringing snacks and drinks into the pool. When your kids go inside to hydrate, they’ll be tempted to bring their glass bottles back outside. However, remind them to finish their drinks and leave their cups inside. Slippery hands lead to broken glass, and broken glass leads to injuries. Therefore, we suggest banning glass cups or bottles outdoors or limiting glasses to grownups only. Whether your kids are playing pool games or swimming laps, they’re going to work up quite the appetite. After eating, the old saying is that you should wait at least 30 minutes before you swim. This is because blood is diverted away from your arms and legs when you don’t digest, increasing the chances of drowning. Make sure your kids rest for a few minutes before jumping back in!